Numerous great works have been created within the realm of Christian art, but none has received as much acclaim as Leonardo da Vinci's Last Supper. Art lovers venerate it for its composition and noble aesthetics, while for Christians it epitomises the intimate relationship between Christ and his disciples. In recent years it has also become the focus of intrigue, controversy and speculation, following the publication of some bestselling fictional narratives and questionable historical studies. Given the recent restoration that has exposed remnants of the original paint-work and removed falsifications created by over-painting, we are now able to contemplate Da Vinci's masterpiece in its original form for the first time since its creation over 500 years ago. 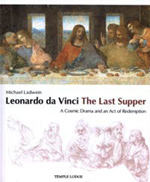 In this lavishly-illustrated, full-colour book - which reproduces many details of the restored work - Michael Ladwein turns his attention to newly-revealed aspects that allow for fresh interpretations. The philosopher Rudolf Steiner called The Last Supper the world's most important work of art, adding that it revealed 'the meaning of earth existence'. Ladwein throws light on many aspects of the spiritual message that can be discovered in this immortal painting - one that has lost nothing of its urgency in our modern world.